Location/ Directions: Take Interstate 78 east and take Exit 58A to U.S. Route 1 and 9 south. Make a right on International Way. 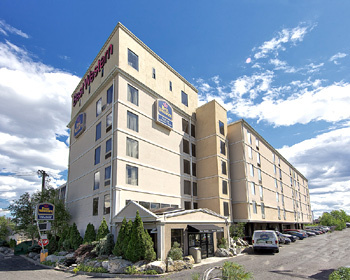 The BEST WESTERN PLUS Newark Airport West is 500 feet to your left. About Hotel: 6-Stories, 83-Rooms, Interior Corridors, Cable satellite 27-inch TV with HBO, AM/FM alarm clock, Coffee/tea maker, Microwave, Fitness Center, Airport Shuttle, Restaurant Onsite, Room Service, High Speed Internet, Complimentary hot buffet breakfast, 100% non-smoking including public areas, Guest laundry, Elevator access to all floors, Multilingual staff (English, Spanish), 24-hour front desk, Ice/vending machines, Airport courtesy shuttle available 24 hours to Newark International Airport, Free parking, Business center, 24-hour snack shop, 24-hour shuttle service to Newark Penn station available, Vending machines, High-speed Internet access, Refrigerator, Hairdryer, Iron, ironing board, Free local calls under 30 minutes, Air-conditioning, Wake-up calls, No pets allowed. Railroad View: Very Good. Any "High Floor" room on the railroad side should provide a good view. Higher floors will be needed to keep above the parking lot and some trees. A row of evergreens are planted along the parking lot. Comments: This motel is close to Newark Int. Airport. Its also close to New York City. Hotel provides a shuttle to Newark Penn Station, from Newark Penn Station, a 15-minute train ride will put you in mid-town Manhattan (NY City). Center Photo: Snapped from a passing Amtrak train, the Best Western is clearly seen from the train. For Amtrak / New Jersey Transit fans; this motel offers the best view of the Northeast Corridor in New Jersey. Aerial Photo: This aerial photo looks east. 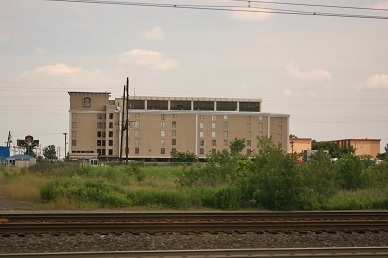 Rooms with a railroad view are on the northwest side of the hotel. 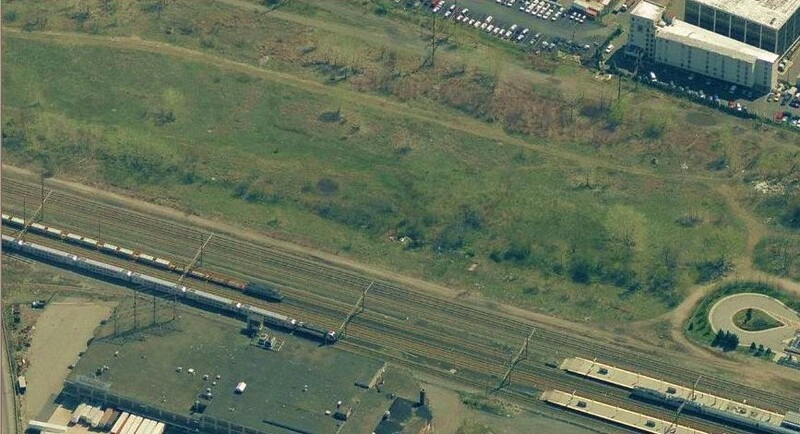 8-Tracks are seen from the hotel, 5 are part of Amtrak's Northeast Corridor (also used by NJT), the 2-tracks closest to the hotel are "freight only", used by Conrail local freights. In this photo, a southbound NJT double decker commuter train overtakes an Amtrak work train powered by a Amtrak GP38 (700 series). Location/ Directions: I-95 Exit 14 to Frontage Rd, then turn right. About Hotel: 3-Stories, 171-Rooms, Interior Corridors, Daily Parking Fee Collected Upon Check-in - To Guests Traveling With a Car, Complimentary WIFI access in all rooms, Microwave and Refrigerator, Full service restaurant on site, No pets allowed, Business Center, Free High Speed Internet, Gym/Fitness Center, AM/FM Alarm Clock, Coffee Maker in Room, 24 hour Front Desk, Handicapped Rooms/Facilities, Hairdryer In Room, Free Newspaper, Laundry Services, Ice Machine, Iron, Ironing Board, Wake-Up Service, Crib and Roll-away Available, Guest Laundry, Satellite/Cable TV with A&E, CNN, Fox News, HBO, Weather Channel, Air Conditioned, Elevators, Gift Shop, Room Service, Vending Machines. Railroad View: Poor / Fair View. Only a few rooms on the 3rd floor on the rear of the motel offer a railroad view. 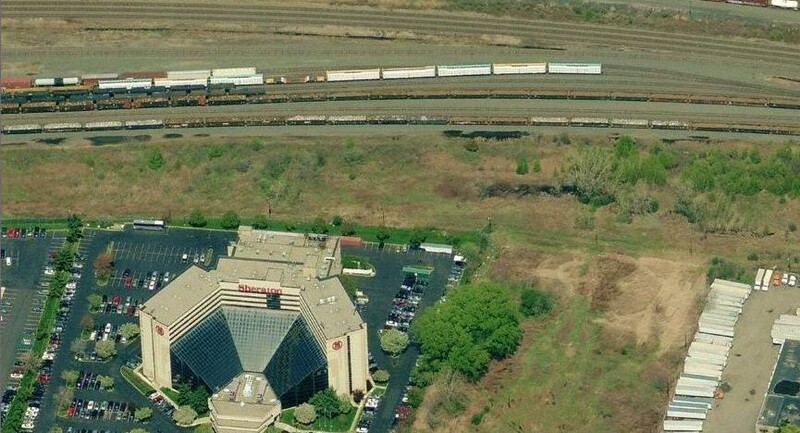 The Sheraton Hotel or the Ramada Plaza Hotel located up the road offer a much better view of the same railroad yard / line. Railroads past Hotel: Conrail Shared Assets (Norfolk Southern / CSX). Oak Island Yard is located behind the motel. Tracks are not close enough to the motel to interrupt sleep. The busy airport & heavily used roadways are another story. Notes: This motel has not been rated by RailfanMotels.com. Internet reviews by guests do not rate this hotel high. Comments: This motel is a half mile from Newark Int. Airport. Its also close to New York City. Photo Comment: The Howard Johnson's motel is seen in the top left of this aerial picture. The tracks can be seen to the right side of the photo. Stacks of shipping containers completely block the view from the yard tracks, three tracks on the south side of the yard are the tracks seen in this picture. Note, trees around the motel block the view from most of the windows. 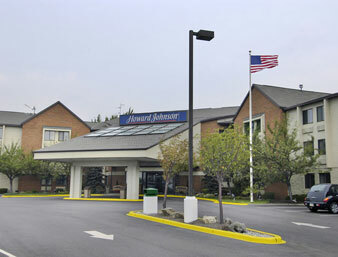 Location/ Directions: I-95 NJ Turnpike, Exit 14, 2nd Right to Frontage Road - Hotel on Left. About Hotel: 11-Stories, 234-Rooms, Interior Corridors, 24 Hour Free Airport Shuttle to Newark Airport, 24 Hour Lobby Cafe, Hunt Room Restaurant serving Breakfast-Lunch-Dinner, Teddy's Sports Bar on site, 24 Hour Exercise Room, Free High Speed Wireless Internet, Complimentary Crib, Rollaway Charge 75.00, 15.00 Daily Parking Fee, No Pets Allowed, Alarm Clock, Coffee Maker, Hairdryer, Iron/Ironing Board, Elevator, 27 Inch Television with Satellite and HBO. Railroad View: Excellent. High floors on the rear of the hotel are needed to view Oak Island Yard. Lower floors will have an obstructed view due to freight cars parked in the yard. Few trees will not foul the view. Railroads past Hotel: Conrail Shared Assets (Norfolk Southern / CSX). Oak Island Yard is located behind the motel. The yard hosts about 40 trains during a 24-hour period. Notes: This motel has not been rated by RailfanMotels.com. Comments: This motel is a half mile from Newark Int. Airport. It’s also close to New York City. 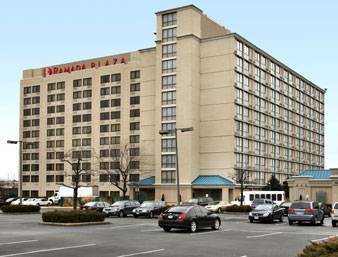 Photo Comment: This dated aerial photo shows the Ramada Plaza Hotel (formally Holiday Inn, as seen in the photo). Oak Island train yard is seen behind the hotel. The photo only shows the south side of the yard, additional tracks are out of view. High floors on the rear of this hotel should provide an excellent view of the yard. About Hotel: 12-Stories, 503-Rooms, Interior Corridors, Roll-away Beds, Hairdryer, Desk, Dual-Line Speaker Telephone with voice-mail, Refrigerator Available (fee), Coffee and Tea Maker, Room Service, Room Features, Balcony, Connecting Rooms Available, Suites Available, Free National Newspaper on Weekdays, Iron/Ironing Board, Air-Condition, Radio/Alarm Clock, Maid Service, Wake-up Service, Individual Climate Control, Wireless High Speed Internet Access (fee), Cable TV, Indoor Whirlpool, Indoor Heated Pool, Complimentary 24-Hour Fitness Facility, Gift/Sundry Shop, Gated Self Parking Facilities, Free Airport Transportation (Limited), 24-Hour Front Desk, Laundry/Valet Service, Wheelchair Access, Vending Machine, Ice Machine, Restaurant (on-site), Internet (fee). Railroad View: Excellent View! High floors on the rear of the hotel are needed to view Oak Island Yard. Lower floors will have an obstructed view due to freight cars parked in the yard and some trees.My room on the 9th floor provided an excellent view. The mainline is on the other side of the yard, I was able to view passing intermodal trains of both Norfolk Southern & CSX. Binoculars and a zoom lens are best for viewing & photographing trains. Windows do not open and passing trains are not heard from the hotel. Only way to catch them is by watching & waiting. After dark train watching is done! There are no lights in the yard, and the hotels dark tinted windows make it impossible to view anything other than headlights. All odd numbered rooms are located on the railroad side of the building. Odd number rooms between numbers ending with 17-33 will provide the perfect railroad view. I was in room # 915 which faced northwest, not a bad view at all, but the railroad was slightly off to the right. 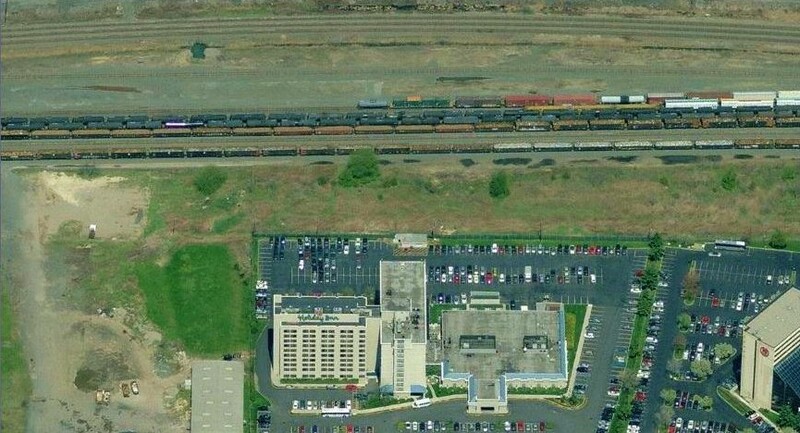 Railroads past Hotel: Conrail Shared Assets (Norfolk Southern / CSX). Oak Island Yard is located behind the motel. The yard hosts about 40 trains during a 24-hour period. NJ Transit trains are also seen in the distance. 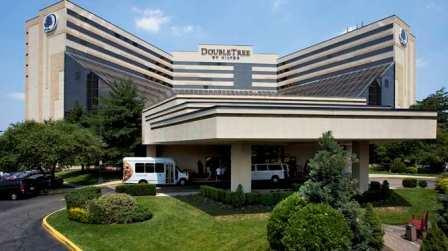 Notes: DoubleTree provides a free shuttle bus to/from Newark Air-Train station P4. It's very convenient. Hotel is geared for air-travelers and is also used by flight crews. For railfans passing through Newark airport, this is a great choice if you need to spend the night. New York City is also very convenient by use of the hotel shuttle to Air-Train station P4 > Air-Train to Newark Liberty Airport Station > NJ Transit from Newark Liberty Airport Station to New York Penn Station. Amtrak also provides the same rail service for a slightly higher price. NJ Transit train tickets can include the Newark Air-Train fare if purchased correctly. My experience between NY City and the DoubleTree Hotel in Newark was a quick, easy and enjoyable way to travel between the two. If you don't use an automobile, I recommend getting dinner before settling in at the hotel. There is no place to walk to from the hotel (except other hotels), no food nearby. The hotel does have a restaurant, bar, and room-service if needed. Comments: This motel is a half mile from Newark Int. Airport. The DoubleTree shuttle bus will bring you to/from Newark Air-Train station # P4. The hotel is also close to New York City, and is an option if you are looking to visit but not stay in the higher priced NY City hotels..
Photo Comment: Aerial photo shows the DoubleTree Hotel located on the south side of Oak Island Yard. The photo only shows the south side of the yard, additional tracks are out of view. High floors on the rear of this hotel should provide an excellent view of the yard. This view seen from room # 933 shows the Oak Island shop. Several locomotives assigned to Conrail Shared Assets are seen parked near the shop building. This view looks northeast from the hotel. A shared pool of locomotives supplied by both CSX and Norfolk Southern are displayed here with a common lash-up of mixed NS/CSX locomotives operating together. This was the yard power (SD40-2 / SD45-2) and was seen often during my stay. A Norfolk Southern trash train is seen by-passing Oak Island Yard as it heads west to it's Ohio destination. Many intermodal train operated both by Norfolk Southern & CSX passed the yard using the same mainline. Yes, those are RBBX circus cars stored waiting to be shipped to their new owners.